The appellate judges sat in a marathon all-day emergency appeal filed by the Attorney General who challenged an earlier ruling yesterday at 3 am, of Justice Frank Seepersad who temporarily blocked the two newest judicial appointments said to be former Deputy DPP Kathy Ann Waterman- Latchoo and Jacqueline Wilson. They were scheduled to take the oath at President’s House yesterday. The swearing in is expected to be done before the end of the week now that the way has been cleared by the appellate court. ON TO PRIVY COUNCIL Maharaj, who was represented by attorneys led by Senior Counsel Anand Ramlogan, is expected to petition the London Privy Council, and said he is confident of victory at the final appellate court. A hearing for conditional leave is expected to take place next Monday. Justice Seepersad, in his 22-page ruling held that Maharaj’s claim was of paramount importance that the citizens of this Republic have confidence and trust in the administration of justice. In that regard, compliance with the law, as determined by the court, is predicated upon a symbiotic relationship that is characterised by mutual respect and a recognition of legitimacy. If there are serious questions as to the validity of the JLSC’s composition…Irreparable damage can be occasioned to the Judiciary as an institution and the public’s confidence in the administration of justice could be fundamentally shaken and undermined, he said. In submissions to the court, lead counsel for the Attorney General, Deborah Peake, SC, argued there was no nexus between the substantive claim filed by Maharaj and the emergency injunction sought and granted. She further contended the judge’s order made no sense as Maharaj’s claim only targeted the appointment of two new judges and not other appointments for which the JLSC was empowered to advise the President on. “Why stop certain appointments,” she asked, pointing out to the judges that third party (the prospective judges) rights’ had been engaged and Justice Seepersad should have considered their rights as well. Peake argued that the emergency injunction application was not urgent as contended, adding also that there was no evidence that the JLSC was improperly constituted when it considered the two new appointments. CASE IRRELEVANT “Even if it (the JLSC) was invalid, you cannot invalidate the actions or decisions made,” she noted. Attorney for the JLSC, Ian Roach submitted that Maharaj’s case was irrelevant and there was no cause of action for injunctive relief. The President’s attorney adopted the submissions of the AG while the Law Association remained a neutral position on the issues raised in Maharaj’s lawsuit. The JLSC members include Chief Justice Ivor Archie, retired Justices Roger Hamel-Smith and Humphrey Stollmeyer, head of the Public Service Commission Maureen Manchouk and attorney Senior Counsel Ernest Koylass. 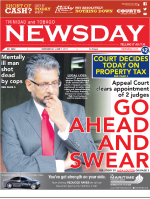 Maharaj was ordered to pay the AG’s cost of the claim before Justice Seepersad and the Court of Appeal while it was only ordered to pay the costs of the JLSC at the appeal. This was one of three lawsuits in recent times against the JLSC. Opposition Senator Wayne Sturge has taken the commission to court over its failure to supply him with information on the appointment of former magistrate Avason Quinlan-Williams who was appointed on April 8 as well as a third lawsuit filed yesterday challenging the decision of the JLSC to grant him a three-year no-pay leave to take up the highly respected post in The Netherlands. The case of the property tax and appointment of two judges were frivolous both in nature and presentation as issues that the people have deep personal interest in. There is no doubt that for political interests they were elevated for show and tell. Judging from the behavior of judge Seepersad, it might be instructive to look outside the legal structure of T&T for impartial judges. The property tax collection required bringing to a government office several personal information. It is a known fact that this government does not know who own what in this country. Now that it is not compulsory, the valuations officers could get off their seats of do nothing and start doing their jobs as required by law. They should go out in the field or address directly the residents in any letter or field action. Why should citizens have to go and line up for hours and then be given a number and have to wait longer. Those who want to do that could. As for law and party that is nothing new.